(Opinion) Commissioner Allan Huber (Bud) Selig should resign. This isn’t the first time anyone has said that, but, in the wake of a drug-suspension-shaving scandal that we uncovered at MLN Sports over the last 2-1/2 months, I am hoping that it will be the last. 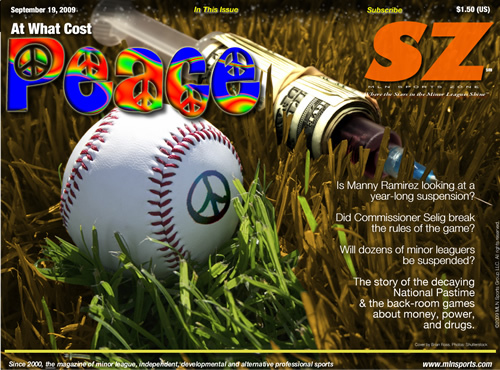 As we reported in our investigative feature story “At What Cost Peace,” appearing in the current edition of SZ (www.mlnsports.com), there are no rules covering drug use in baseball. Article featured in the digital sports magazine "SZ" Sept. 2009 now available at Scribd.com (See below). So how, you might ask, does a Manny Ramirez or a J.C. Romero receive an announced 50-game suspension from the Commissioner’s Office for testing positive for the use of Performance Enhancing Substances? You can be suspended for all kinds of high crimes in MLB or MiLB baseball. You can gamble, as Pete Rose did. You can throw a game, as the 1919 Chicago Black Sox did. Not drugs though. Nothing for drugs. That is run through a side deal to the Collective Bargaining Agreement. At best, it’s a gentlemen’s agreement between the owners and the players to keep the peace with the union. At worst, it has been a dog-and-pony show for the public that makes a mockery of the Mitchell Report. Instead of a get-tough program for anti-doping, Selig is reading even his own rather distorted framing of the rules incorrectly, and using it to help players on suspension shave off games, or stay in-tune, despite the fact that every rule of the game, every thread of the CBA, and even the section of the Joint Drug Agreement that he misuses all say that he can’t do it. A major league player in the minors on a “rehab” always is doing major league service. So what was J.C. Romero doing on a minor league ball field during the regular season playing for the Lehigh Valley Iron Pigs (AAA)(International League) only 22 games into his suspension? Selig is making a mockery of the rule book used for more than a century, in my opinion. The tug of war between the union and ownership is the primary concern for him. The game is getting lost. I will let the article, which took more than 2-1/2 months and many many hours of interviews, tell you about how screwed up MLB has become as a result of the mess that Commissioner Selig has made of the post-Mitchell era anti-doping program. It is time for a change. Donald Fehr, the feared union boss of MLBPA, is retiring in early 2010. Bud Selig is an owner. He never belonged in the chair of the Commissioner. The players have never trusted him, and the fans openly mock the inventor of the tie All-Star game. He has ignored the guidelines of the Mitchell Report, and demonstrated to the world, through the PES shaving of games, and his disregard of the rules, that greed and power trump the rules of the game and principle. Maybe the National Pastime does reflect the times that we live in. This entry was posted on September 20, 2009 by Brian Ross in 2009, Baseball, Bud Selig, Corporatocracy, MLB, Sports and tagged Baseball, Bud Selig, Donald Fehr, J.C. Romero, Los Angeles Dodgers, Manny Ramirez, Mike Cameron, Milwaukee Brewers, Mitchell Report, Mlb, MLBPA, Performance Enhancing Drugs, Performance Enhancing Substances, Philadelphia Phillies, Sergio Mitre, Sports, Steroids.